Please complete the short form below and choose how you would like to pay for your Tester kit "Business in a box"
Please provide the referring Agent's details. - A stylish silver cosmetic case and material drawstring bag. - A fragrance list and Pure Skin info guide. - 50 anonymous business cards to promote your business & ensure that customers contact you for repeat orders. - An order/receipt book to keep track of your orders, payments and customer's information. - 1 branded pen to record orders. - 1 book of 100 smelling strips – if customers don’t want to test fragrances on their skin. 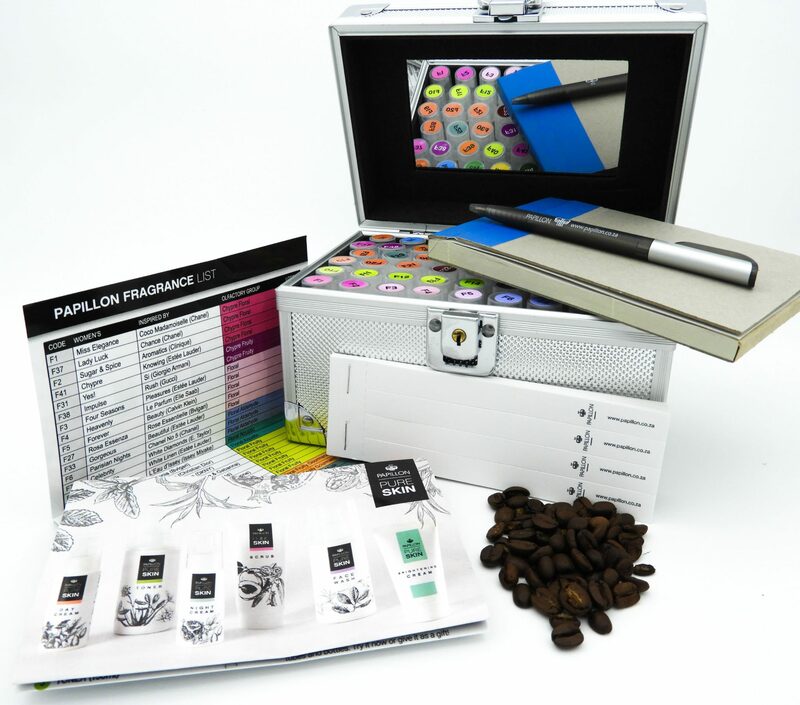 - Container with coffee beans – for customers to neutralize their sense of smell when testing different fragrances. - 2 material drawstring bags. - 30 x 5ml atomizers/testers for skin testing on customers. (Top - 20 Female Fragrances & Top 10 Male Fragrances). Expand your kit to the full range as your business grows! - 1 material drawstring bag. - A fragrance list info guide. - 15 x 5ml atomizers/testers for skin testing on customers. (Top - 15 Female Fragrances & Top 5 Male Fragrances). Information is needed for delivery or referral purposes. PLEASE provide as much info as possible so that the courier can find you easily and to avoid delays! Only provide your physical address NOT PO Box information. Yes, show me the payment options. No I am hesitant to make a payment now. PAPILLON uses PayFast, a 100% secure online payment platform. In the unlikely event that your Global 1 card is not registered for online shopping (almost all are), please contact your nearest Capitec branch to activate it. -Orders placed after hours, on weekends or public holidays will be processed the following business day.